For readers who weren’t aware of our history you can check out this article from 2009. 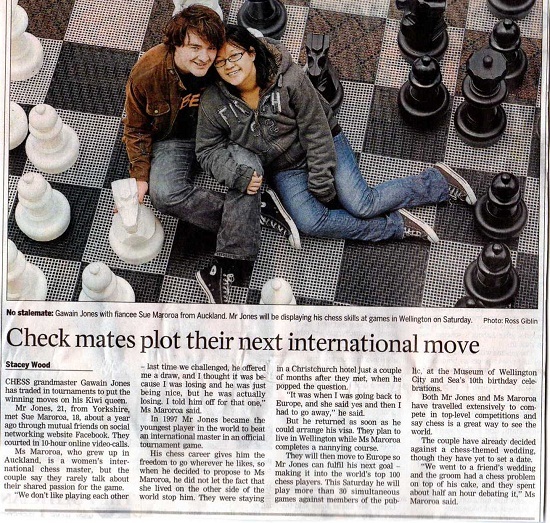 The actual journalism quality was not fantastic as at times they misquoted us but in general it was all good publicity for chess. We were actually front page news for The Dominon which is the regional paper for Wellington, where we lived in New Zealand. I remember feeling very self conscious the morning the paper came up but I don’t recall anyone recognizing me. At the moment, I am trying to process my FIDE transfer from New Zealand to England. I have no heard anything from FIDE yet but will update when I find out anything concrete.